What if you live in the United States? Some eyewitnesses of living pterosaurs would rather forget what they saw, for they fear the obvious name: “pterodactyl.” One eyewitness in the Anza Borrego Desert in Southern California was troubled by the word his friend used for what they observed soaring in the distance (“pterodactyl”). He said something like, “it has to be a kite or something” (from the nonfiction book Live Pterosaurs in America). So why did that man choose to leave the area before nightfall? If there ever were such a thing, kite flying in that remote desert has long ago become extinct. His friend has no doubt: They saw the real thing. You don’t need to be crazy to see a living pterosaur, regardless of what you call it. Brian Hennessy, a psychologist from Australia who has lived in China for years, used the word “prehistoric” for a flying creature seen by an eyewitness on Bougainville Island, New Guinea, many years ago. The eyewitness did not go to Hennessy for counseling; Hennessy himself is the eyewitness. The point? You don’t have to be crazy to see a living pterosaur. A psychologist is the least likely person to unknowingly hallucinate anything and Hennessy was not alone when the large “prehistoric” creature flew overhead. 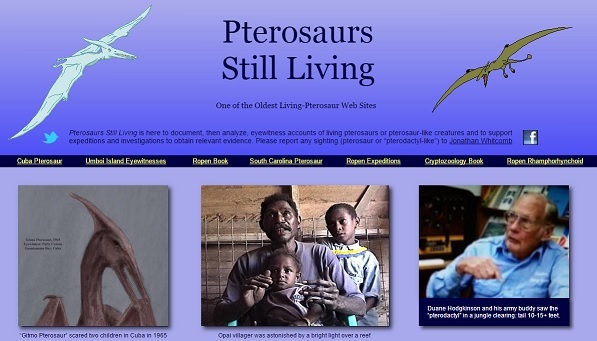 Living pterosaurs have been reported in the United States. This nonfiction cryptozoology book may appear shocking, but it logically explains why these wonderful flying creatures have seemed to have remained hidden in North America for so many years. The eyewitness testimonies have been analyzed individually and collectively. The result? Astonishing! Read the many eyewitness sighting reports; buy the nonfiction book Live Pterosaurs in America, on Amazon or elsewhere. What’s more, please consider: Your purchase of this cryptozoology book shall help support future research. Yes! You can enjoy the satisfaction that you have contributed to further *investigations, by your purchase, while you learn about these wonderful living creatures. In addition, the book explains the cultural challenges faced by the American eyewitnesses. Read the words of these ordinary persons living in California, New Mexico, Texas, Florida, Ohio, Kansas, Michigan, and many other states. The first edition was a number-one best-selling book, by far, on Amazon.com for nonfiction books about living pterosaurs. (late 2009 through mid-2010, compared with Searching for Ropens, Dinosaurs Dead or Alive, and Big Bird.) Find out why it is more popular; read it yourself. The word “kor” is used around Manus Island, including, perhaps, the smaller islands in northern Papua New Guinea. I haven’t been to those islands myself, but I received information from a university student: a young native man from that area. He himself saw the flying light just a few months ago, so this extraordinary phenomenon continues to this day: large flying creatures that glow and that are described (when seen close or in daylight) in terms suggesting living pterosaurs. Brian Hennessy I interviewed myself. I usually try to get a handle on the kind of person who reports to me a sighting of an apparent pterosaur, and this was no exception. He appeared to me, from what we communicated, to be healthy mentally. Being a psychologist, however, he makes a much greater impression here. Remember that this man is a psychologist, with a professional reputation to consider. Thank you, Mr. Hennessy, for sharing this information and for letting us know your name. It confirms the credibility of these investigations into sightings of the wonderful flying creatures that many researchers believe are living pterosaurs. Pingback: Live Pterosaur» Blog Archive » How absurd! A Frigate Bird!